I think one of my regrets for traveling in and around the Baja/Sea of Cortez area of Mexico was that we didn’t go to that many places. Sure we hit as much of the La Paz islands as we could, but there were so many stops farther north that we just didn’t make time for and the weather was getting too cold. We took advantage of winds heading south and across to the mainland and sometimes that’s what you have to do when you’re mainly dependant on weather. What I’m getting at, is that we have these Mexico cruising guidebooks by Shawn Breeding and Heather Bansmer (pretty much every cruising couple owns these books and when I’ve referred to our “guidebook” it’s the one I’m talking about). We bought one for the Sea of Cortez and only utilized three out of the 14 chapters. There’s A LOT to see in that area. Bummer we couldn’t see more. 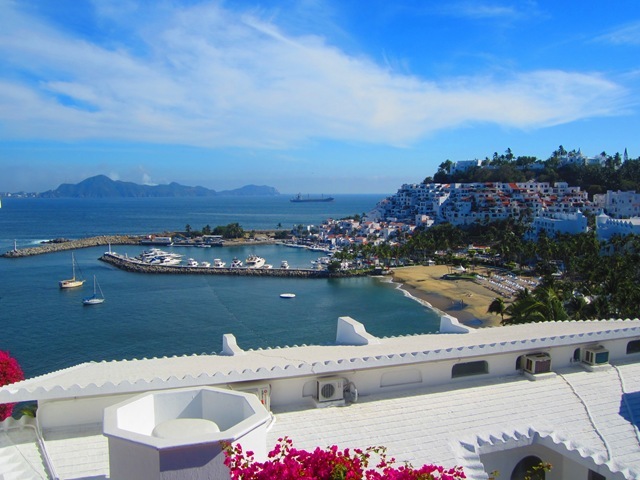 However, I am happy to report that as of Manzanillo, our most southern stop on this adventure, that we have now utilized four out of seven chapters of the Pacific Mexico cruising guide. I know that still doesn’t sound like a lot, but it’s more than half of the book…and two of the remaining chapters are super short. 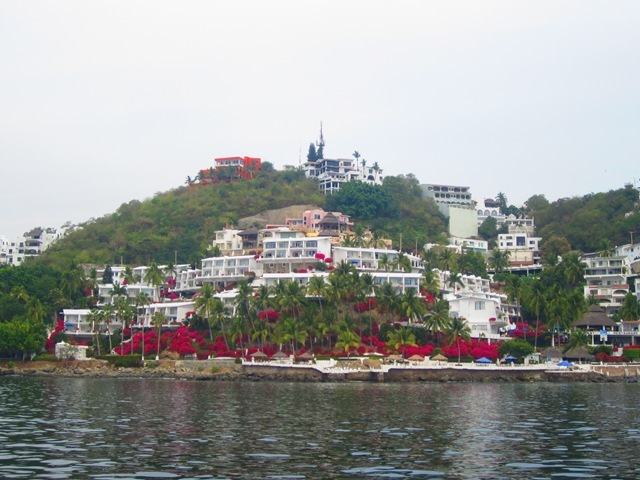 But onto the sailing…we had another smooth sail, although, upwind, into Manzanillo. There was a bit of confusion on my part as to which anchorage we were pulling into. 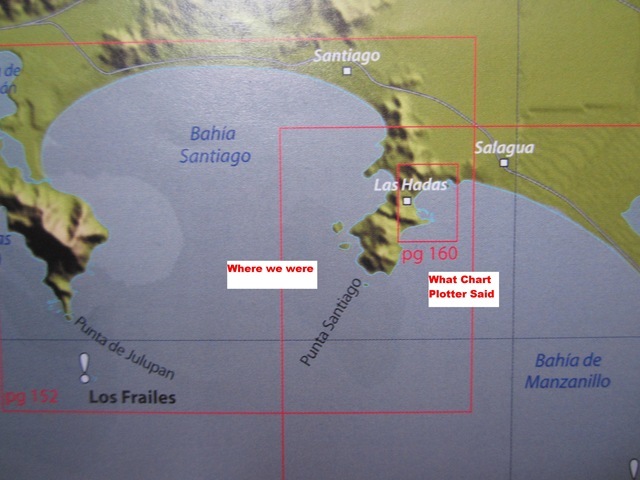 The chart plotter is so off at this point that it showed that we were past the point (Punta Santiago) that we needed to be around before heading towards land and into the anchorage for Las Hadas (Manzanillo). But we weren’t past it, not even close, so I thought the bay just around the corner from Las Hadas, called Santiago Bay, was where we needed to go. Dave and I had a quick debate and figured out that we still had a couple miles to go based on the guidebook’s anchorage waypoints (lat. and long. coordinates). We were able to use the wind and the current to sail right into the Las Hadas anchorage with just the mainsail up. Dave gets very excited about these things while I sit in the cockpit and try to wrap my mind around how we’re going to stop the dang boat to anchor while the sail is up. (Hey, I only took ONE sailing course). Apparently, just heading into the wind will suffice and we anchored without much issue. You can’t beat the view from this anchorage. 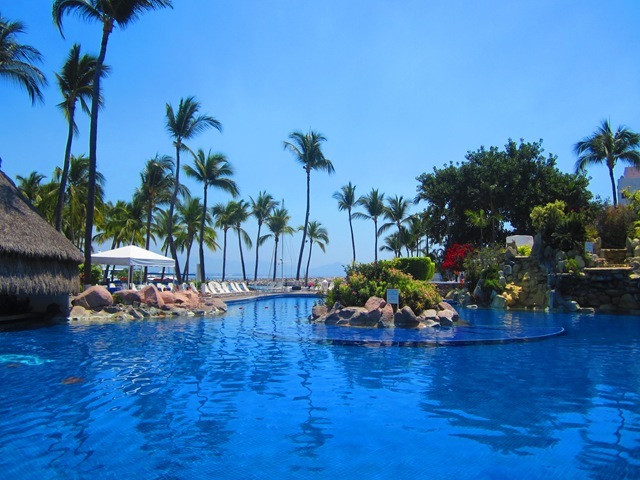 The water is super calm since you’re protected from the wind and swells (except for the occasional, annoying jet skier) and the beautiful Las Hadas resort lines the beach. For 200 pesos per dinghy you can use the marina/resort’s dock to tie up and use the hotel’s services; mainly the pool, but still a decent deal if you want to hang out all day. View of Las Hadas from the cockpit. We liked the pool, but it was a bit chilly for swimming and the restaurants have ridiculous prices (aka – American prices), so we stayed for a couple hours and then headed back to the boat for lunch. But since the day pass is good for 24 hours, we headed back to shore to get our moneys worth. We wandered around the grounds and got our bearings as to where the bus stops were for heading into central Manzanillo, we found a calm beach down the way where we could tie the dinghy up safely and for free, and a restaurant with a good happy hour and free WiFi (which, for a couple of drinks we got the WiFi code and were able to pick up the signal from the anchorage for the rest of our time in Manzanillo – SCORE!). 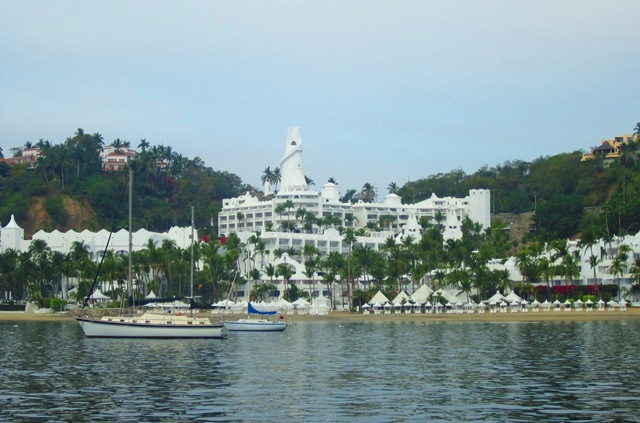 Las Hadas Resort pool, spiral tower and views of the marina and anchorage. Heading into Central Manzanillo was fairly simple. We hopped on the only bus that stops through the Las Hadas area for 6 pesos per person. 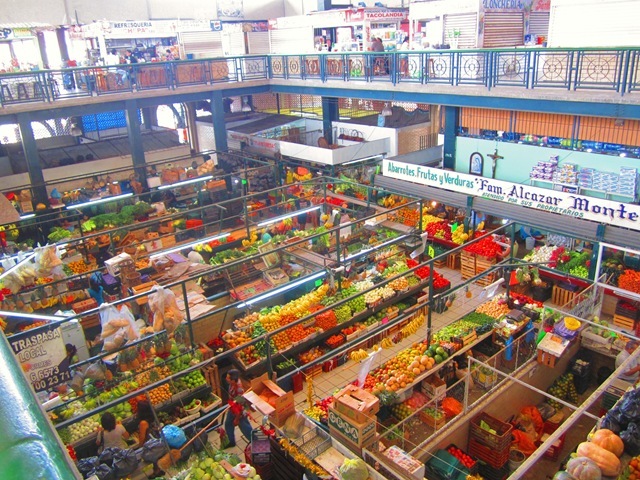 That bus stops at Soriana, a large supermarket/Target-like store; from there you hop on the next bus that arrives that says “Centro” in the window (for another 6 pesos). 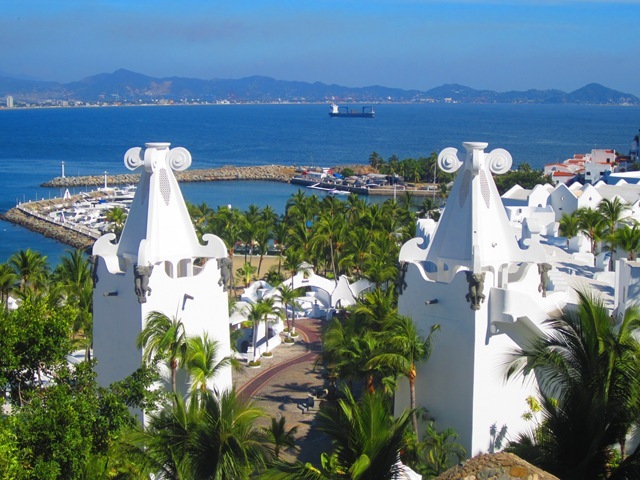 There are multiple lines that run into the Centro area and we just got off when we saw the main Manzanillo harbor with all the large tankers and fishing boats. 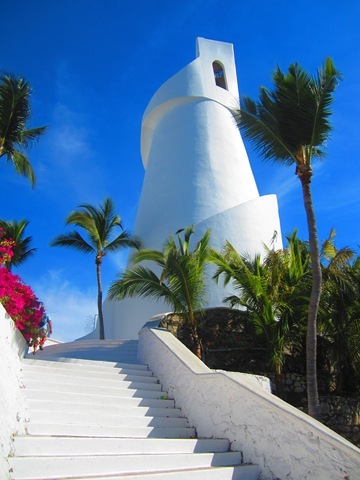 From here we quickly recognized the large, blue sailfish statue that was listed in the guidebooks as a must-see. 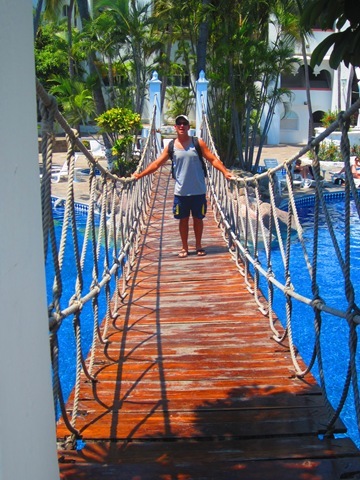 From there we just roamed the streets looking for a good place for a little breakfast and seeing what Manzanillo had to offer. 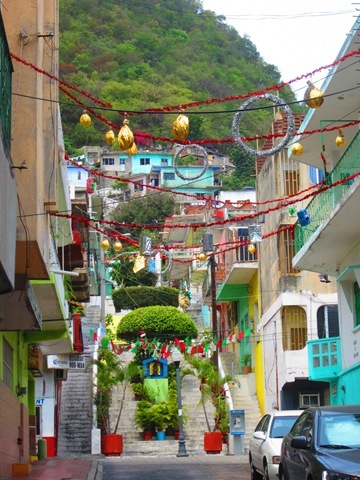 Sailfish statue (top), streets of Manzanillo (bottom left), and the 5 de Mayo marketplace (bottom right). 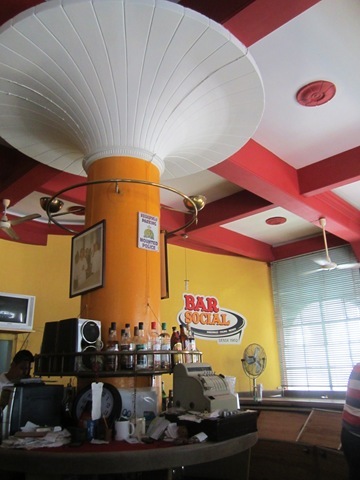 Bar Social (left) and our spread of botanas with Caesar drinks. On our way back to the boat we stopped to walk through the Soriana to grab a few items and passed the Manzanillo cinepolis (movie theatre). We were curious to know how much a movie ticket costs in Mexico. 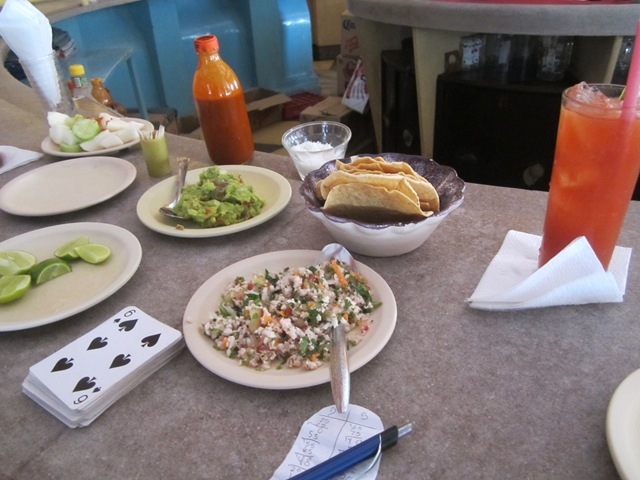 At least in Manzanillo it’s only 35 pesos (about $2 USD). Granted, most of the movies are American with either Spanish dubbing or subtitles, but that’s pretty amazing to only have to spend $2 for a movie. The teenager behind the ticket counter asked what it was in the United States and Dave said ten, but I said it’s probably more like $12 now. Oy. 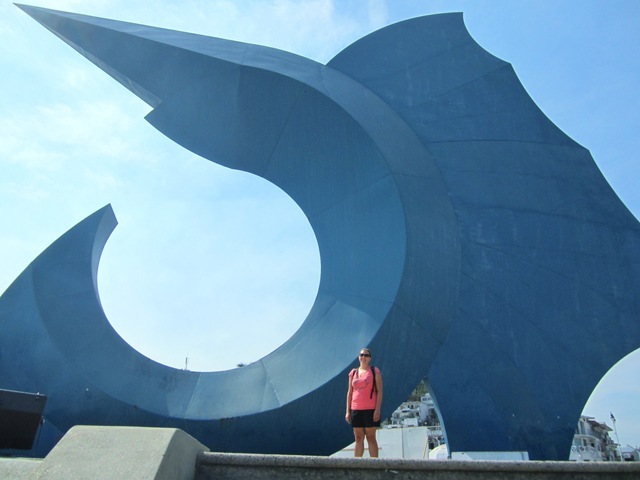 I’m very happy that we made it as far south as Manzanillo – it was a good last southern stop.